Examples of facilities that the UCTs may be tasked with installing include underwater nearshore cables and pipelines, shallow water ranges, moorings, the Offshore Petroleum Discharge System (OPDS), and aids to navigation. Most other installation operations require heavy construction equipment and are within the scope of other Navy activities. The UCTs will frequently be tasked with assisting other activities on large installation projects requiring diver support. Each installation task may impose unique circumstances, and the exact techniques used must be determined by the personnel familiar with the situation on a case-by-case basis. Planning and estimating data are provided in each section. For an operation to be a success, it is essential for the UCT to be aware of the conditions at the site. Section 1.4 lists the information about the site that should be obtained before deployment. UCT personnel will generally be involved in assisting with the installation of new cable facilities. Execution plans and planning for the cable installation are normally prepared by NFESC Code ESC55. The primary responsibilities of UCT divers will include assisting in landing the cable from the cable ship to shore and associated work with providing stabilization and protection for the cable. The UCTs may also conduct preinstallation surveys of the proposed cable routes to mark the submerged route and shoreline and to establish navigation guides for the cable landing. In some cases it may be necessary to actually conduct the cable installation. In this case it is usually from a ship of opportunity. Whether assisting or conducting the installation, it is necessary to understand the general procedures associated with cable installations. Cable installations are extremely complex and require careful planning to ensure that all support craft, materials, support and operational personnel, and technical representatives for splicing and handling of the cable are on hand at the right time. Availability of personnel and vessels must include provisions for contingencies, such as weather and equipment failure. • A survey of the cable route, the detail of which is dictated by the available "as-built" or existing information. • The required length of cable to be installed. • The conditions encountered on site. Detailed information concerning site survey techniques can be found in Chapter 4. The majority of cable-laying operations in which the UCTs have participated involve cable termination at a facility that is far enough inshore to allow termination in a fixed, dry, protected, and accessible environment. Cable termination to shore cables is typically done in an underground cable vault. An existing cable vault may already be installed, which would require only that new penetrations be made. Otherwise, a new vault must be constructed. 6.2.1.1 Navigation and Tracking System Stations. The landing of a cable usually involves a special navigation technique - a pair of range poles. Navigation range poles are essential in cable landing operations. Erecting targets (range poles) onshore for alignment of the cable is required whenever cables are brought into shore from the cable-laying ship. 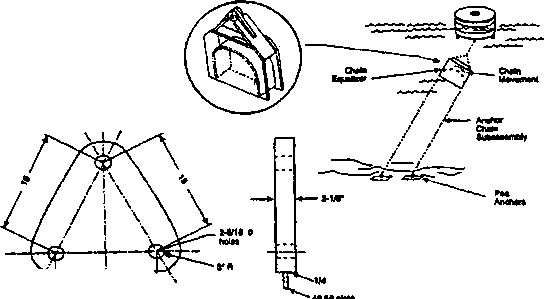 The idea is to provide a pair of range poles, as illustrated in Figure 6-1. They should be vis ible from the cable layer, and in line with the proposed cable route. NOTE: Targets are vertically aligned when cable layer is on planned route to vault.